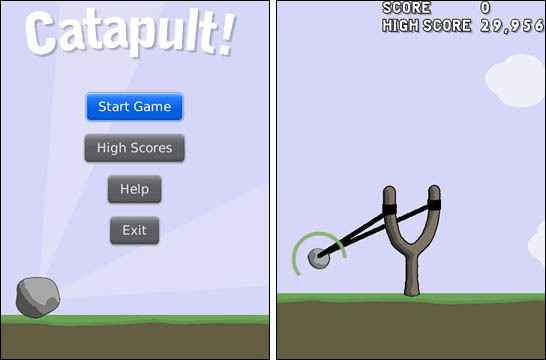 Fling boredom away with Catapult, a rockin new game for BlackBerry! A common goal of games on mobile devices these days is to see how far you can fling, jump, fly, or soar an object or character. I found a game last night that is in this genre, called Catapult, by Dekerta Software. The objective is simply to fling your rock through the air, and see how far it will go. There are targets you can hit which increase your score, springboards on the ground that bounce you back up into the air with a burst of speed, and sandboxes that will bring your stone to an immediate halt. Catapult has a great UI with simple graphics and a really smooth feel. I played on my Torch (also compatible with 83xx, Curve 85xx, 89xx, 9000, 93xx, 91xx, 95xx, 96xx, 9670, 97xx,and 9800) for almost a half hour, and the game never lagged or felt sluggish. I hope the future brings updates like maybe more levels or different sized rocks or something, just to mix it up. For now though, I feel Catapult is worth the $.99 price tag. My high score (so far!) is 58,487. If you beat me, post your score in the comments!